Gitmo has a gift shop. It's true. Visitors to the U.S. military's extrajudicial island oasis can pick up Gitmo key rings and Interrogation Instructor tee shirts, whose torture-humor tastelessness rivals the Coed Naked line. How the hell'd we end up here? That's the question filmmaker Alex Gibney attempts to answer in his new doc Taxi to the Dark Side, which the cinetrix was fortunate enough to catch as a sneak screening on the last day of Full Frame last month. It seemed fitting to see the new film at the same fest where his previous, Enron: The Smartest Guys in the Room, met with such acclaim. 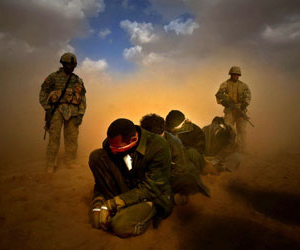 As in that film, Gibney methodically maps out the decision-making processes of a large organization, linking the fog of ambiguity at the loftiest levels of government with the confusion clouding the definition of torture among the grunts on the ground at Abu Ghraib. Hovering between the center and the periphery of this story is an Afghani taxi driver named Dilawar, who was murdered while in U.S. custody in Bagram. In this era of extraordinary rendition and indefinite detention, the devil is in the details. Taxi traces what happens to the real people caught in the miasma of shifting definitions. Geneva common article 3 no longer obtains, U.S. officials say, and their persiflage does its best to obscure the fact that the "worst of the worst" still have not been captured. Instead, detainees become Persons Under U.S. Custody. NECs [non-enemy combatants] are renamed NLECs [no longer enemy combatants]. American due process is replaced by military tribunals. Cheery PR reps show journalists through Potemkin Gitmo rooms carefully labeled "tour cell" and "tour interrogation room" and boast about detainees' "comfort items." It's schizo. Actual psychosis can be induced by sensory deprivation in only 48 hours, mild-mannered McGill professor Dr. Donald O. Hebb explains. When the CIA appropriated the results of his behavioral research and deployed them in the dehumanizing laboratories of Bagram, Abu Ghraib, and Guantanamo, the FBI moved to disassociate itself in a series of emails so redacted sometimes only a few words make it through. Often deployed in concert with the now sadly familiar interrogation techniques the feds objected to--dogs, invasion of space by a female, sleep deprivation, the "sissy slap" glove, enemas, so-called birthday parties at which "God Bless America" sung at the detainee, waterboarding and other stress positions, even air conditioning--hooding and muffling the hearing of detainees is meant to break their resistance. Often, it breaks their psyches. Gibney demonstrates how use of these techniques, originally authorized for a few high-profile prisoners at Guantanamo, like alleged "20th hijacker" Mohammed al-Qahtani, quickly spread with the tacit approval of the administration, a product of force drift and the government's pressure on the military to deliver results. The cumulative effect was torture. In building its case, Taxi rounds up the usual suspects, deftly deploying archival news footage and talking-head interviews. Alberto Gonzales is in there. John Yoo sits placidly in a book-lined office and describes how his infamous memo circumvented the Geneva Conventions and redefined torture. Lamenting the administration's disregard for the rule of law, former POW John McCain advocates for the Detainee Treatment Act, only to allow it to be rendered toothless in committee. And when former Navy general counsel Alberto Mora questions the necessity of detainees standing for hours at a time, a wise-cracking Rummy briskly dismisses his concerns in a handwritten note: "I stand for 8-10 hours a day. Why is standing limited to 4 hours?" Gibney wants the leaders held accountable for failing the soldiers in the field. To that end, he turns his camera on the little guys. Gruesome photographs--not just from Abu Ghraib but previously unseen documentation of abuses at Bagram--punctuate the film. A former interrogator who worked at both places blithely describes how he'd carry on one-sided conversations with detainees about whether Elvis was the King or read them the labels on cereal boxes, then write up reports saying he'd done so, which were never questioned. One of the detainees he questioned was a British subject, Moazzam Begg, who details how he was abducted in Pakistan and transported to Gitmo, where he languished until pressure from the British government secured his freedom. A former FBI interrogation expert scornfully dismisses "ticking time bomb" justifications for extreme interrogation techniques, explaining in a broad Boston accent that there's no such thing. Programs like 24 may create a pop culture constituency for torture, but an actual terrorist would rather die than reveal information; he has time on his side. Time ran out for young Dilawar, the Taxi driver of the title. The American troops who interrogated and ultimately murdered him thought he was behind recent rocket attacks on their base. When he didn't confess under interrogation, the tactics turned lethal. He couldn't confess. This Wrong Man, whose story sent Gibney down this path to the dark side, was innocent. Sargeant Salcedo at Bagram explains that the Afghan warlord who turned over the taxi driver was responsible for the rocket attacks himself. He'd tossed the military some innocents to ingratiate himself and make a buck. That's intelligence gathering? Like the "worst of the worse" they seek, those at the highest levels of government who have winkingly authorized torture may also elude capture. A provision tucked into the 2006 Military Commissions Act retroactively grants the commander in chief and his administration immunity from prosecution for any wrongdoing, much less war crimes, from 9/11 onward. Taxi makes it clear that time is on the side of the "bad guys." There were 83,000 detainees in U.S. custody when Gibney locked picture, but only a handful could be construed as front-line soldiers. But every day they languish in legal limbo, denied access to any justice save military tribunals, the U.S. creates more insurgents. And there is no end in sight. The cinetrix was delighted that Taxi to the Dark Side snagged Best Doc honors at Tribeca. Here's hoping it'll land distribution and be coming soon to the proverbial theater near you. If it doesn't, seek it out.